For AIRPORT LIMO SERVICE in the Overland Park and Kansas City Metro region, don't look any further than the BEST LIMO SERVICE in town! With service to all business airstrips and MCI, we cater to everyone flying the airways above our lovely and historic city! 1) Private and Personal - We consider this an opportunity to give an air weary traveller the private "me" time they so desperately desire. When you've been locked in a tube the size of a paper towel roll, you are ready to stretch out a bit! Whether you prefer quiet, soft ambient music, or a rock concert on the way to your destination, our drivers will be happy to provide to your interests. Private. Personal. It's about you. 2) Predictably Plush - Predictable is not a bad thing around here. When you ride with Overland Park Limo Service, you know what you are going to be getting...a POLISHED and PLUSH experience! Predictably Posh! From the aesthetically clean lines, and the soft, supple leather to the glasses in the bar, and the lights surrounding you at night. You will know that you have made a wise choice for your relaxing ride! 3) Pleasantly Punctual - Our drivers are professional, polite, and punctual, delivering to you a pleasant experience. Don't worry about having to find a rental car once you arrive, or parking your car at the terminal for long amounts of time. Our drivers will arrive 15 minutes early and be ready to have you to your destination on time! To book your Overland Park Limo now, call 913-956-0088! Flying in from Boston? 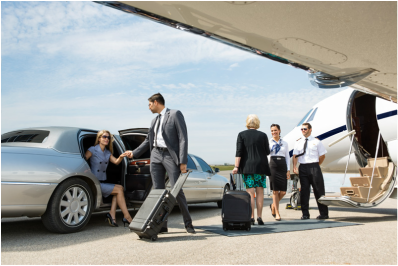 On your return flight, make sure you book your transportation with our partners and friends in the industry, Best Boston Limo, for your limousine rental.